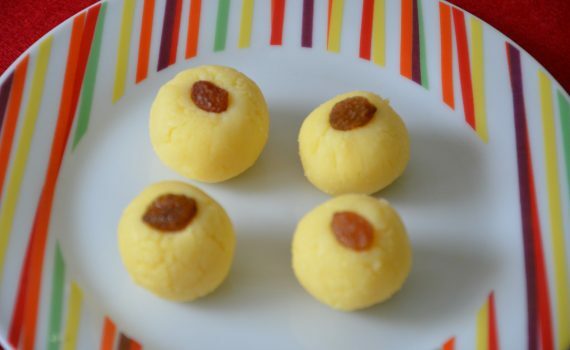 This is a quick peda recipe and takes just 3-5 minutes. A tasty recipe for when you are in a hurry and still want to make a dessert or mithai. I make this for Diwali. Sweets are fine if you don’t eat it on a daily basis and also know when to stop. Festivals, birthdays and special occasions definitely deserve a sweet treat. In a microwave safe dish, melt the butter, then add in the milk powder and condensed milk and mix well. Cook in the microwave for a total of 3 minutes, mixing well after every minute. After 3 minutes, mix well again and leave aside for it to cool down. After it has cooled down enough for you to handle(say 5-10 mins), grease your hands and make balls (You can also take the entire mixture and flatten it on a greased sheet with a rolling pin and use different shapes (cookie cutters) to have cute shapes). Gently press the balls and flatten them a little and place a raisin or a sliver or pista/badam.